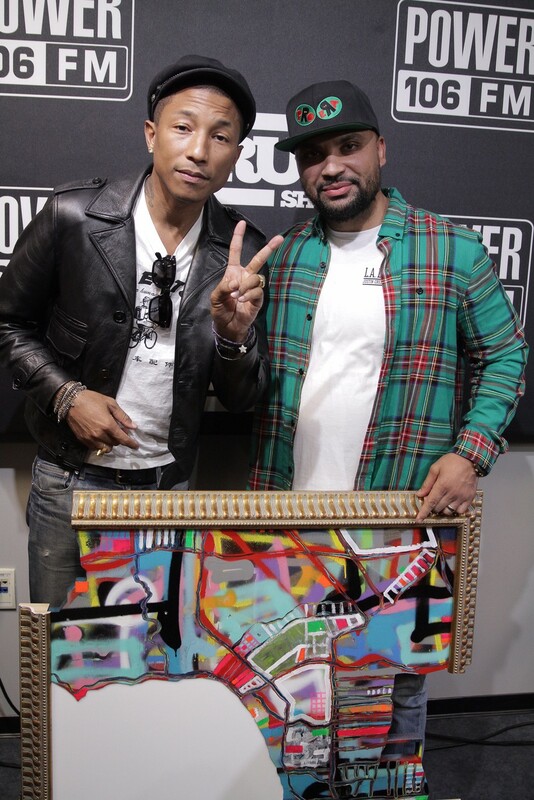 About a month ago, we wrote about local artist Ben Joyce having one of his paintings snagged by hip-hop star The Game when the musician saw Joyce's work on the walls of a Los Angeles radio station Power 106 where his childhood buddy Vinrican works as a producer. Now it's happened again, except the star who fell for Joyce's unique style of painting-meets-sculpture is considerably brighter than The Game. That would be Pharrell Williams, he of the unavoidable hit "Happy" (among many tunes) and judge on The Voice. Pharrell (left) with Joyce's buddy Vinrican. Joyce says his buddy has several of his pieces dotting the Power 106 studios, and has sent along several photos of hip-hop royalty doing interviews and on-air appearances right in front of his work. He'll be posting some of those to his Facebook page down the line. You can read our cover story about Joyce here, and visit his website right here.